A preamble, because I want you to know that it was a rocky road getting to the point where I could hit ‘Publish’: the universe is conspiring against you, insofar as it is conspiring against me, willfully trying to make sure I never manage to get this recipe prepared and photographed. First it was a mislabeled package of “chicken thighs” that turned out to be chicken tenders (just… no.). Then it was a spate of haphazard power outages the next day, when the first three grocery stores I went to to get actual chicken thighs were all dark. And then it was a series of unfortunate occurrences making sure that my memory card was never near a computer with Photoshop, which makes photo editing, uh, difficult. And that’s not to mention a whole series of dark, rainy days combined with totally uncharacteristic shortages of various pantry staples at home. But I prevailed. And I did so because, guys: this is not only a well-composed salad with moist, flavorful chicken and an excellent balance of complementary crunchy, sweet, and cheesy bits. 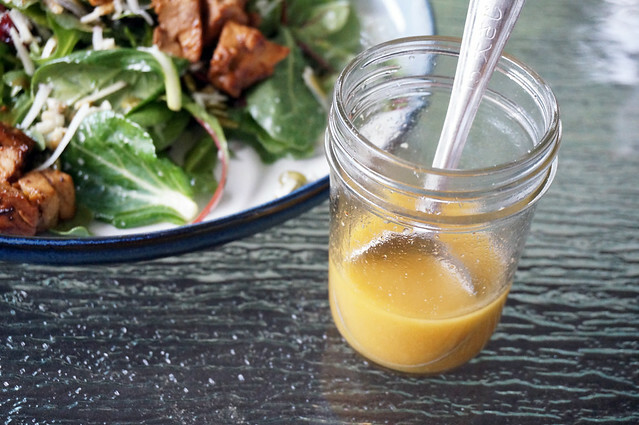 I mean, it is that, but the real clincher here is the vinaigrette, which is the best kind of ridiculous: it’s made with the oil from cooking the chicken. So, in defiance of some sort of malevolent cosmic force that doesn’t want you to eat salad both topped and also dressed with chicken, I bring you: double-chicken salad. Use it for good, not evil. The central gimmick here is that the salad not only comes with chicken on it, but also has a chicken-infused vinaigrette. 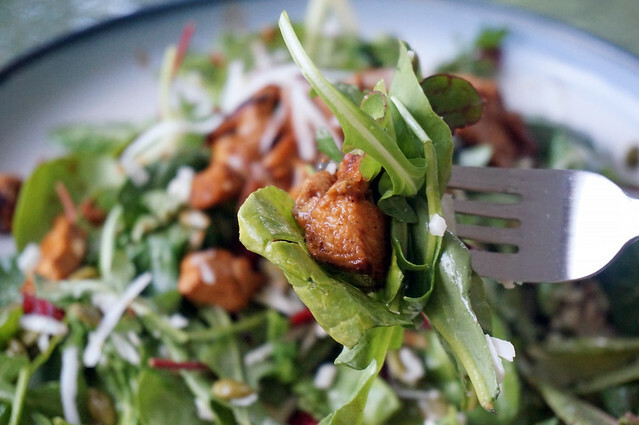 If you’re like me, that’s sold you already, but in case you’re a normal person, you’ll also want to know that this salad combines a nice variety of crunchy, sweet, and cheesy bits, along with tender, juicy chunks of deeply-browned chicken. Not just a party trick, this is a solid, meal-sized bowl of leafy delights. Whisk together the 3 Tbsp olive oil, 3 Tbsp lime juice, chili powder, salt, honey, and garlic. 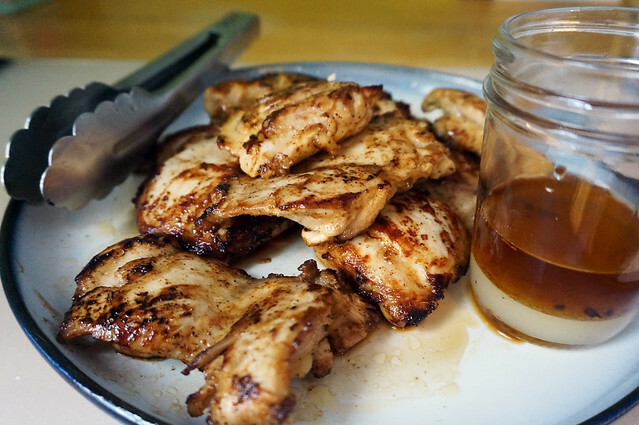 In a glass dish or a zip-top bag, pour over the chicken thighs and let marinate, chilled for 1-2 hours. In a large skillet over medium-high heat, heat the 1/4 c olive oil until it is very shimmery, but not smoking. 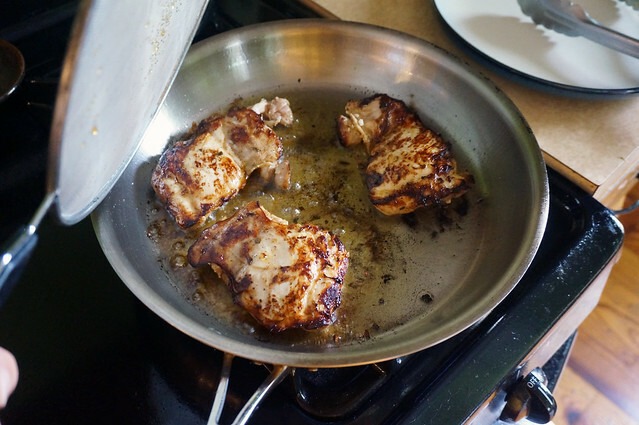 Add as much of the chicken as will fit without crowding, and cook without disturbing for approximately 3 minutes, until well-browned; the chicken should release easily from the pan. Flip and cook the other side without disturbing for another 3 minutes, until it is also well-browned and the chicken is cooked through. (If you have very thick chicken pieces, you may need longer on each side.) Remove the chicken to a plate and continue with the rest of the chicken in batches. Pour off all the oil in the pan, reserving it for use in the vinaigrette. 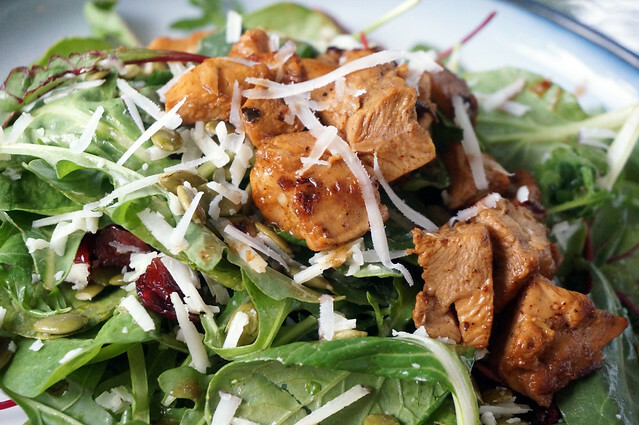 Chop the chicken into salad-sized pieces. Return the pan to high heat and pour in the 1 Tbsp water and 1 Tbsp lime juice, scraping the bottom of the pan with a wooden spoon as it boils to release all the brown bits. Once the pan is fully deglazed (that is, all the brown bits are incorporated into the liquid), add back the chopped chicken and its collected juices, tossing to coat. Cook briefly until the liquid is almost completely cooked away. Tada, salad chicken! You will likely have a full 1/4 c of skillet oil, but if not, top it off with additional oil. Add the remaining vinaigrette ingredients and whisk to combine. Combine the greens, pepitas, cranberries, manchego, and vinaigrette in a large bowl and toss to combine. Plate and top with the chicken (and more cheese if you like, because why not more cheese?). Enjoy all the salady goodness. Make ahead note: this is a perfect throw-things-together-straight-from-the-fridge meal, except that the vinaigrette likes to solidify at fridge temps. Five to ten seconds in the microwave should loosen it up, or about five minutes at room temp for you non-microwave folks. During one test batch I ran out of lime juice before I could deglaze the pan, and I used a couple tablespoons of dry white wine instead. Very nice. I originally made this salad with quartered dried apricots, but then ran out of those, too (seeing the pattern). It turns out I rather like the cranberries here, but I can also attest that apricots are lovely in the salad. I like salads to be just barely dressed, and this amount of vinaigrette will last me through all the chicken. If you like a rather wet salad, you may need to boost the vinaigrette proportions: just increase everything proportionally. More comfortable at the grill than the stovetop? Feel free. 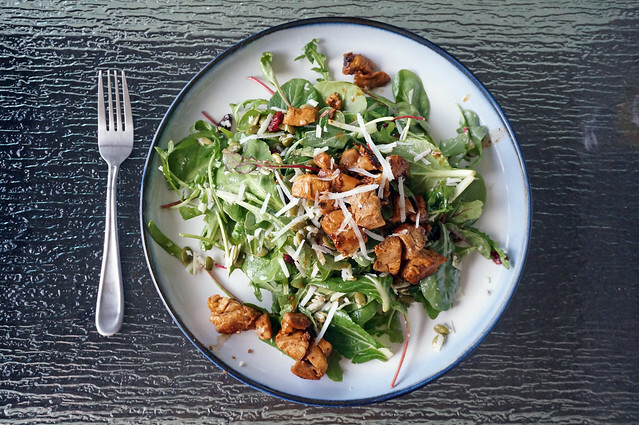 You won’t be able to get the chicken-infused vinaigrette, of course, but the marinated chicken should still make a lovely salad; just use non-chicken-infused olive oil for the vinaigrette.